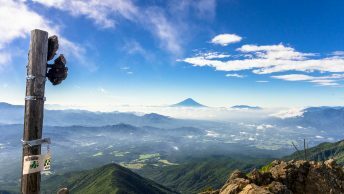 With the autumn weather arguably at its finest this hike takes in some delightful views from the relatively secluded Mount Gozenyama. While most hikers start from Lake Okutama this hike commences from the Sakaibashi bus stop a short 10 minute bus ride from Okutama Station. From the bus stop walk back along the bridge, turn right and follow the road for 2.6 km to the Taiken no mori 体験の森. This local access road tails the Tochiyorisawa Creek passing a fish farm as it winds up to a small mountain village and the Citizens Forest management building. As of November 2014 the Tochiyorisawa Creek trail to the Otaki Fall is closed thus the road is the only means of access to the trail head. Before you reach the trail head there is a small rest area near the Tochiyorino Otaki Fall. From the rest area keep following the narrow road which passes several more trail closures. The actual trail head is a little difficult to pin down but roughly corresponds to location marker 12 on the map boards. From the trail head to the Gozenyama Refuge Hut takes around an hour and is particularly beautiful with yellow and brown autumn hues augmenting the fine weather. The hut is clean and well-presented and has a small watering hole. 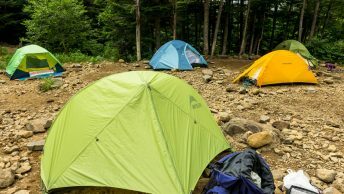 If you plan on setting up camp the summit is better with a flat open area to pitch a tent. From the hut to the summit of Mt. Gozenyama 御前山 (1,405 metres) is a short 10 minute walk through the roped off bollards. The summit has plenty of benches and makes a great lunch spot while providing a clear line of view towards Mt. Fuji. When you’re ready to head off the trail drops down to Mt. Sogakusan where it picks up the Obuna Ridge for a long and sustained descent to Lake Okutama. Some sections are rather steep with lose rocks hampering progress on this rather interminable ridge. A rest spot can be found around Mt. Sasuzawayama サス沢山 (940 metres). The final plunge to Lake Okutama is easily the most arduous, though makeshift ropes have been thoughtfully erected to assist with getting down safely. The bus stop is located on the opposite side of the Ogouchi Dam wall and the Nishi Tokyo Bus takes only 15 minutes to Okutama Station. Did this today, Monday, April 9, 2018. It was a great hike. I had good news and bad news. The good news was that the first trailhead was open! The bad news was that the trail became impassable about a mile down the trail and I had to turn around! The trail starts out weaving back and forth along the Tochiyorisawa Creek. This part of the walk was really fun. I love running water. Unfortunately, just as it reached the Tochiyori Otaki, the trail got really steep and was just very loose dirt. I turned around. Despite the lost time, I made the trip in 6.5 hours and easily made it down before dark. 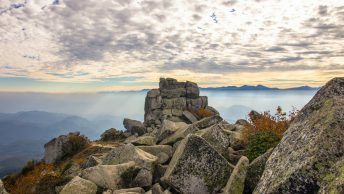 The view of Okutama Lake from Mt. Sasuzawa was even better than I’d imagined. It was so picture-perfect that I stayed there just taking pictures and looking around for about 10 minutes. Good that you managed to finish the hike. From memory that last section of trail coming off Mt. Sasuzawa down to Okutama Lake is just gnarly. May I check with you , what time did you start the hike? I plan to do it next week. Not a very experience hiker, I am a tourist. Hi Gladys, at least when I did the hike I started at 8:00am and finished just after 13:00. I would suggest trying to start around this time in the morning and giving yourself an extra hour or so to finish it. I got to Okutama at 9:22 and got on a bus at 9:30. I started the hike at 9:36. I lost about 1.5~2 hours at one point when I had to turn around because the trail was impassable. I got down to the dam around 4:15. There are 1 or 2 buses back to Okutama most every hour from the visitor’s center next to the dam. The last one is 8:18 PM. I’m with David. Early is probably better. I would like to have gone earlier, but the train times and the bus times just didn’t line up very well to go earlier. I am in the area a lot so decided to risk a bit later start. Gladys, it just occurred to me another thing to think about. Next week is Golden Week. Monday, Thursday and Friday are National Holidays and most recreation and tourist places are crowded. Tuesday or Wednesday would probably be less crowded in the mountains. Thank you so much David & Patrick. I am going from Shinjuku. That means I will have to set off early and be at Okutama before 9am? If you use google maps, you can search from Shinjuku Station to Sakai (in Okutama). It will give you the right train and bus times. Look carefully. The wait for the bus is longer or shorter depending on what time you get to Okutama Station. Did this hike on April 29th, 2018. Just wanted to let interested parties know that the first trailhead is completely passable now, and totally awesome. We did not notice any particularly impeding loose dirt. The waterfall was lovely, and the hike was varied and interesting. Even though Okutama was disgustingly busy (lineups to fill 3 buses at each bus stop, we walked from Okutama station), the mountain was very quiet. Only passed a couple dozen people the entire hike. Highly recommend it! Thanks for your trip report and good to hear you didn’t have any problems completing the hike. Hi Patricia, may I check with you what time did you start the hike and around what time u got back ? Wondering if it’s good for newer hiker like myself and my guy friend.